Water Cannons complete XT Jetter package leaves no drain unclogged, no pipe unplugged and no surface unclean. Available with power up to 5.5 GPM and pressure up to 4200 PSI, the XT Jetter cross-functions as a drain cleaner and high power pressure washer, making it one serious cleaning machine. A Honda GX 630 engine and choice of Annovi Reverberi or General Pump brand pump drive the jetter. Standard bells and whistles include a selective hydro pulse feature for pulsation on demand; an adjustable throttle to control operating pressures from 100 PSI upward; and a ball valve shut off component for protection. Likewise, a 15-gallon fuel tank, electric key start and portable wheel kit are included. The package isnt short on accessories either. 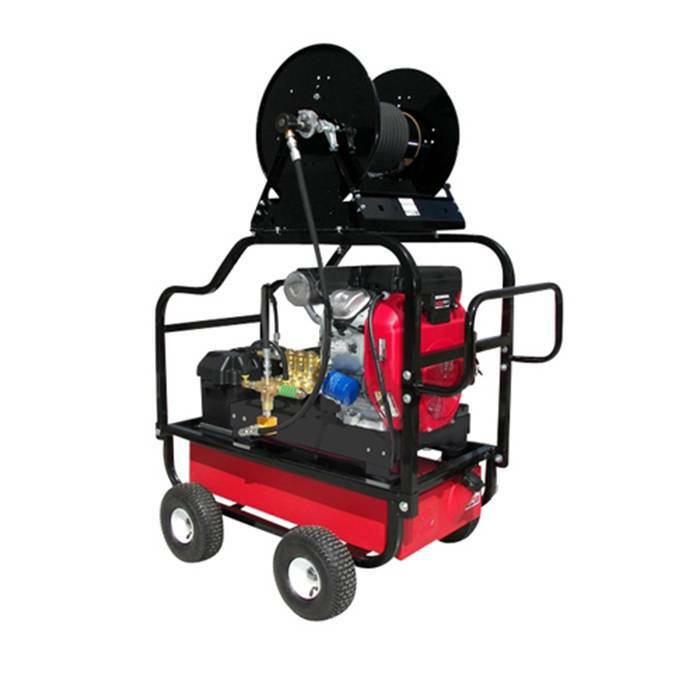 The XT Jetter system includes a Hosetract hose reel to house an included 300-foot long 3/8-inch Piranha brand jetter hose; four stainless steel jetter nozzles; and a 50-foot super kit that offers the option to pressure wash and expands the jobs for which the jetter can be used. Finally, this jetter has unrivaled warranties, including a three-year engine warranty, five-year pump warranty and lifetime frame warranty. • Average weight 395 lbs. Apply for a Water Cannon NET 30DAY Account HERE! These engines are approved for sale in all 50 State and comply with the EPA and Carb 3 standards.